If there was a category for cutest movie, this film would definitely be a contender. The story is dramatic but also has just the right amount of comedy mixed in to keep things from getting too heavy and there is an inspirational quality that draws you in. I like that the film makers have assembled a group of real people to interact with rather than relying on over exaggerated stereotypes and cookie cutter personalities. This adds a documentary feel to the narrative that is enhanced by how the movie was filmed which is an intimate portrayal of the struggles, hopes, dreams, and realities of everyone's lives. The star of the movie is clearly Rina Kawaei who plays the lead character Shiori in such a lovably subtle way, you can't help but relate to her every move. Shiori is very reluctant as the faces unexpected and often unwanted challenges but she ends up facing them head on in very determined fashion. Hayato Onozuka plays Kanji, a young man who appears to want nothing to do with his family's legacy of owning the sake brewery that Shiori has been sent to intern at. A lot of the story is predictable, you can already guess that Shiori and Kanji end up being attracted to each other (not telling you how it ends up), but it's not a problem as there is more of an emphasis on watching the characters as they grow and learn. 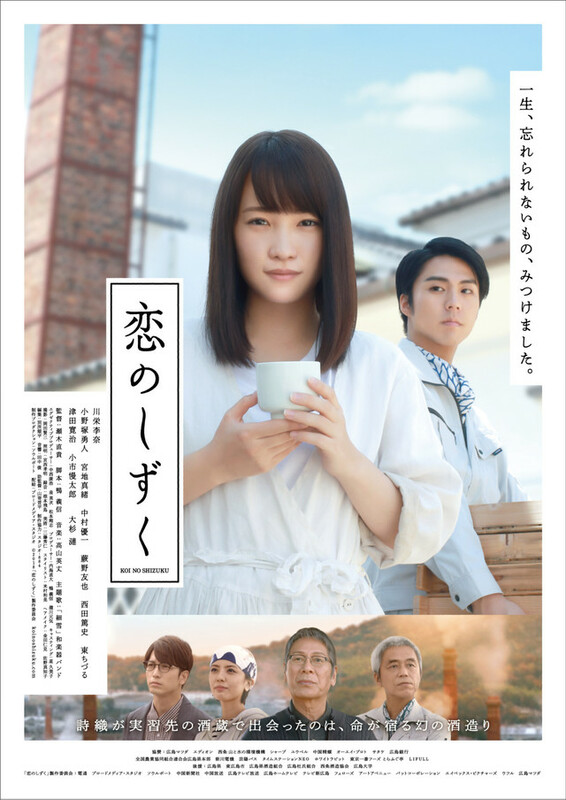 Director Naoki Segi, who I believe lives in the area that the movie was filmed, takes great care in giving significance to the supporting cast members including a standout performance from Mao Miyaji as Misaki who works at the brewery and takes on a friendly mentor role with Shiori. Misaki provides much more than just the typical supporting role and ends up with a very important story arch of her own before the movie is finished. Another emphasis by the director is on making sure the viewer sees just how beautiful Hiroshima, and the surrounding area, is. There are plenty of shots with beautifully majestic backgrounds with mountains and water and the cit skyline, it definitely made me want to visit the area to see it all for myself. For Love's Sake is a charming love story and love letter to Hiroshima and to the traditional sake breweries the city is known for. Naoki Segi takes the same care and attention to detail as the brewery masters he honors by creating a story about finding your passion and choosing your path in life. For Love's Sake is an official selection of the 2018 Hawaii International Film Festival.